Visit the land of the Zulu and feel the power of their fascinating beliefs, customs and traditions while on a cultural safari in northern KwaZulu-Natal. The colour and vibrancy of Zululand combines beautifully with superb bush and beach activities. On a cultural safari you will discover that the Zulu kingdom isn't just a place, it's a Living Culture, evolving with the times but with strong roots linked to the past. Zululand has a turbulent history and you can explore the memory of the Anglo-Zulu War and hear stories of the great King Shaka on your journey.During your experience you can visit a sangoma (traditional healer); examine the intricate Zulu bead work which tells a story (a means of passing on advice or information); take a look at the making of the complex patterns and symbols in the basket ware; find out why cattle are so important in Zulu culture and attend the festival of the Royal Reed Dance which is a magnificent occasion held every year in September. 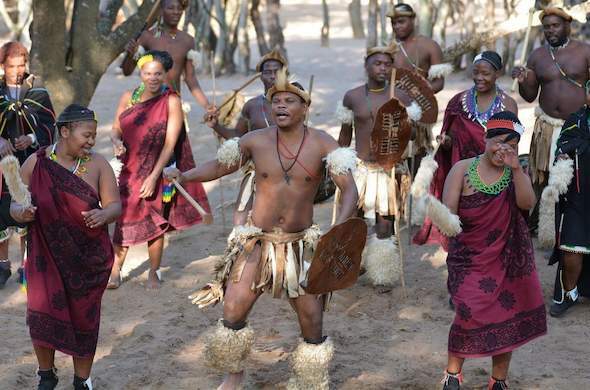 At Thanda you can experience Vula Zulu, where this living culture is celebrated with tours, interaction and thrilling displays of traditional dance. Stunning arts and crafts are on display and you can see the way spears are made or discover the complexities of basket weaving, a skill that is handed down from generation to generation. Enjoy beer tasting and a meal as part of the experience.At Thanda you will find many delightful Zulu touches and influences which express the union between Zulu culture, wildlife, romance and exclusivity. It's a luxurious escape and offers game drives, guided walks, bush meals, a kids club and junior ranger programmes plus a full range of excursions and tours to suit all interests.